The Solar-Stellar Spectrograph (SSS) is a project dedicated to long-term observations of the Sun and Sun-like stars. Using a unique fiber optic feed, we are able to observe both the brilliant Sun and the faint stars with the same instrument, directly comparing the Sun's variations to those of its nearest cousins. With these observations, we hope to better understand the current and historical brightness variations of the Sun, the nature and variety of stellar activity in general, and the likely extent to which long-term solar variations might contribute to climate forcing here on Earth. The SSS is a complement to the now terminated Mount Wilson HK project, begun in 1966 by Olin Wilson. Wilson's long term observations of stellar activity cycles revealed much about the variability of Sun-like stars, the operation of the magnetic dynamo that powers the cycles, and the variations of the Sun relative to its closest cousins. The SSS offers not only broader spectral coverage than the Mt. Wilson photometer, but also the opportunity to observe both the Sun and the stars with the same spectrograph via dual fiber feeds. Other programs have typically required indirect observations (e.g., of the Moon) to obtain "solar" spectra. The galaxy and planetary folks are always publishing gorgeous pictures, while we just produce spectra and flux-color diagrams, which from a PR standpoint are real yawners. So we decided to decorate our front page with a few cool images. The SSS is enclosed in a big triangular case about five feet on a side. The platform with all the optics is isolated from the case to minimize vibrations, and the whole thing is covered by a heavy lid. We affectionately call it "the coffin." The picture at right shows it as it looked before commissioning (and the interior is mostly unchanged today). I have labeled a number of the essential components. 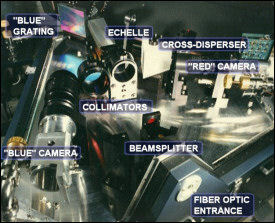 Note the two spectrograph systems: the "blue" HK spectrograph is on the left side, and the "red" echelle is on the right. We have replaced the detectors (and everything else downstream of the cameras) under our new research grant. Our observing station is at an elevation of 7,260' about 10 miles SE of Flagstaff. This picture was taken at sunset from the catwalk of the dome (visible in the overview section above) on November 13, 2005. The red sky at night was not, in this case, an observer's delight; it eventually clouded up and I went home early. But I was glad I happened to have my camera with me! Supported by grants from the National Science Foundation. The SSS is publicly funded. Unless explicitly noted otherwise, everything on this site is in the public domain. If you use or quote our results or images, we appreciate an acknowledgment.